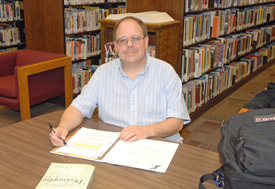 Showing 38 articles from March 15, 2013. 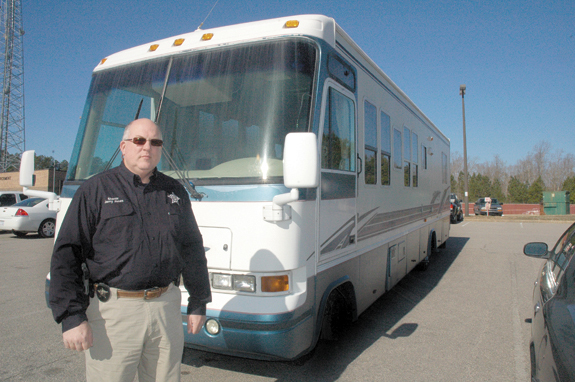 LOUISBURG — More than a year after taking office because of the abuses of a drug fund, Sheriff Jerry Jones said he’s put seized drug money to good use. The sheriff’s office purchased an R/V for $13,500 and will convert it into a mobile command center. “I was afraid not to have something with the situations we could have with school (shootings) and different things happening,” Jones said. Authorities said a family was preparing to take a Franklinton man off of life support following injuries the cyclist sustained in a wreck last weekend. According to a report by Sgt. K.J. Hornaday, Robert J. Perry, 55, was crossing the southbound lane of U.S. 1, against the light, when the accident was reported at about 10 p.m. on March 9. PILOT — Sheriff’s deputies targeted a small section of a highway and made a major drug bust. The afternoon of March 13, narcotics officers arrested a Willow Spring man and seized nearly 60 pounds of marijuana. 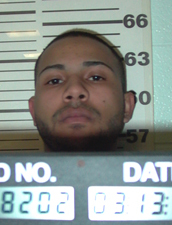 Michael Bauza, 22, was charged with two counts of trafficking marijuana, felony possession of marijuana and felony maintaining a vehicle for a controlled substance. A story in last Saturday’s edition of The Franklin Times created an incorrect impression about the source of funds being used to help a Franklin County company, Palziv, in its efforts to rehabilitate a water tower on its property. The news story, based on a Committee of 100 meeting, indicated that Louisburg had access to a grant that could have been used as a loan to Palziv, which is located in N.C. 56 in the former Hon facility. 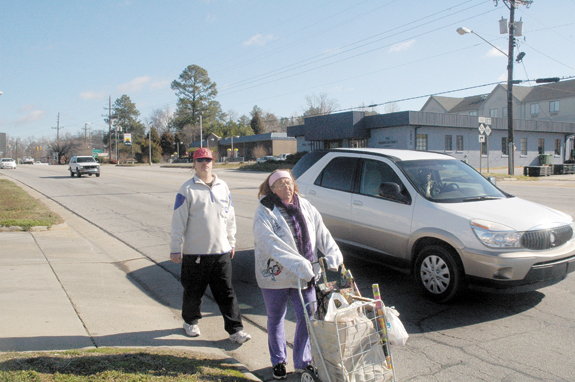 Daniel McCann and Barbara Power make their way down Bickett Boulevard recently. Their trip was made a bit more dangerous along the roadway because of the lack of sidewalks on the northern end of the five-lane road. The town of Louisburg has explored installing sidewalks and crosswalks along the road, but no financial commitments have been made. GOOD MORNING: A letter this week from Louisburg resident Joseph A. Pearce Jr. called my attention to the fact that there is a local connection to Wesley Houston Spencer Everett, 48, who died at his home in Chapel Hill on March 2. According to Joe, Everett was a great-great grandson of Wesley Houston Spencer of Louisburg, who was a junior law partner of noted attorney and Superior Court Judge Charles Mather Cooke, whose home, “Northfield Hall,” once stood on the current site of Franklin Regional Medical Center. 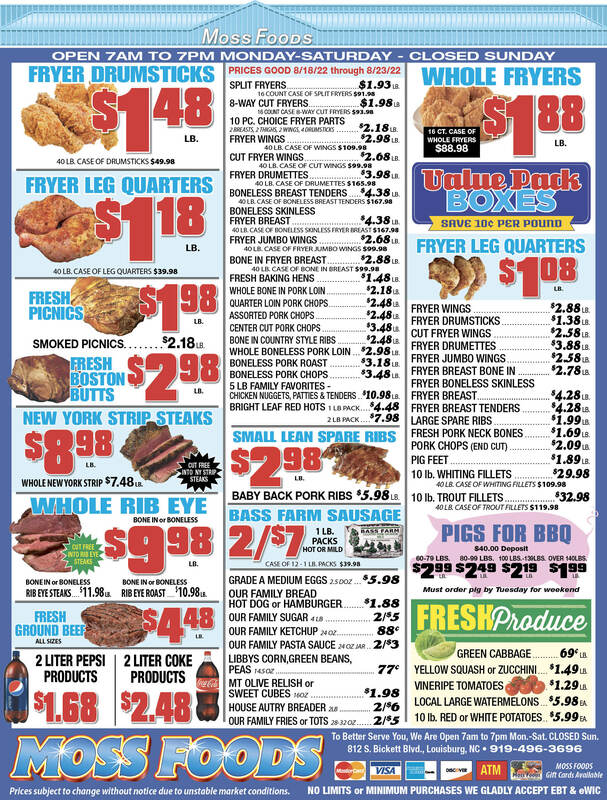 Here we are halfway through March and, maybe, if the weatherman is right, a warming trend is finally in our future. At least today (Saturday) is supposed to be beautiful and the forecast for the next several days is for more traditional, early spring-like weather. About time, if you ask me. Something on the order of 80 degrees and sunny for a few days would be a welcome change from cold, dreary, cloudy days of late. Garner building for future; where does that leave us? 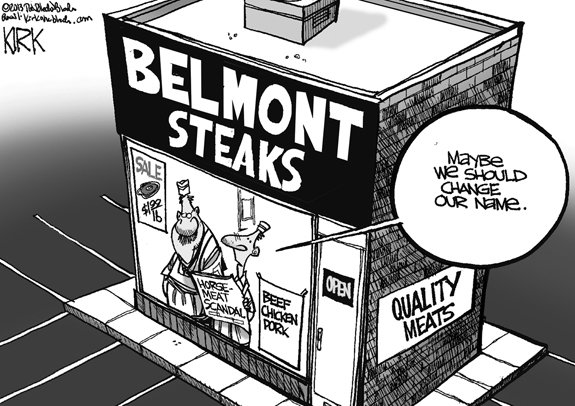 One of our nearby neighbors did something this week that, perhaps, we ought to seriously consider doing ourselves. The details need to be different but the concept is worth a look. The city of Garner put a total of four bond issues totaling $35.7 million on the ballot. Interestingly, voters approved all four by a wide, wide margin. All received at least 66.5 percent approval and one reached about 74 percent approval, amazing tallies for bond issues in a down economy. LOUISBURG - Funeral services for Jennie Bessie Fogg Williams, 90, who died Wednesday, March 13, 2013, will be held at 2 p.m. Sunday, March 17, at God’s Vision Ministry, with the Rev. Sidney Dunston officiating. Burial will follow in the Allen Chapel Church cemetery. LOUISBURG - Funeral services for William “Short Cake” Ellis Jr., 69, who died Wednesday, March 13, 2013, will be held at 2 p.m. Tuesday, March 19, at St. Delight United Church of Christ, with the Rev. Maurice White officiating. Burial will follow in the church cemetery. ZEBULON - Oscar Barwick Jr., 89, died Tuesday, March 12, 2013. 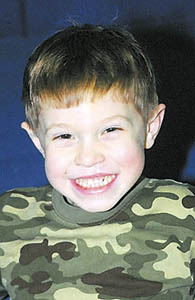 Funeral services were held Friday, March 15, at Strickland Funeral Home in Wendell. Burial followed at Montlawn Memorial Park. GREENSBORO —Eugene Wright Jr., 84, formerly of Wake County, died Monday, March 11, 2013 at Moses H. Cone Memorial Hospital. Funeral services were held Thursday, March 17, at George Brothers Funeral Service, with burial following at Guilford Memorial Park. FRANKLINTON — Annie Ruth Harrington, 89, died Monday, March 11, 2013. Arrangements by Walker Funeral Home, Lillington. YOUNGSVILLE-Bernard Mattis, 79, died Sunday, March 10, 2013. Arrangements by Bryan- Lee Funeral Home, Raleigh. LOUISBURG - Annie Perkerson Inscoe, 95, of Louisburg died Friday, March 15, 2013 at Hillside Nursing Center. ZEBULON - Jean Beddingfield Hinnant, 82, of Zebulon, died March 10, 2013. She was the daughter of the late Ivon William Beddingfield and Thelma Alford Beddingfield. Jean was preceded in death by her husband of 31 years, Thaddeus Edgar Hinnant, Jr. IN THERE. 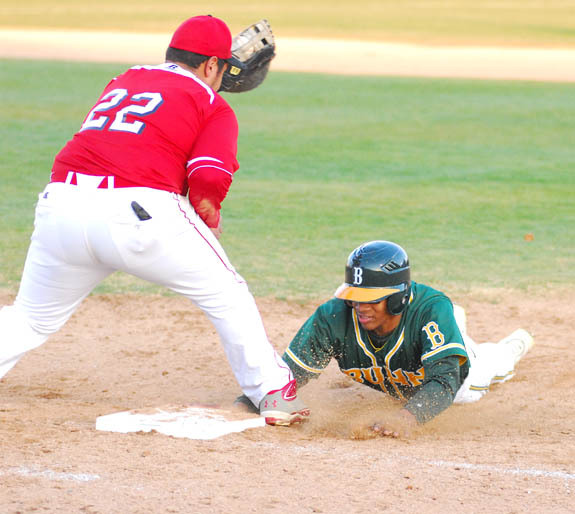 Bunn’s Brandon Batchelor (right) beats a pickoff throw back to first base as Franklinton’s Brandon Brady defends during Wednesday’s Northern Carolina Conference baseball showdown at BHS. 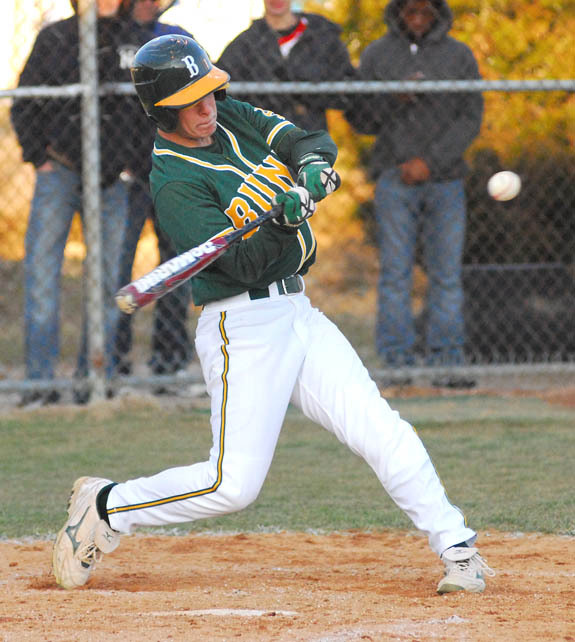 BUNN -- Bunn boasts its most senior-dominated team in recent baseball memory this spring. But look for two of the biggest contributors to be the youngest kids on the roster -- freshmen Nicholas Sanders and Spencer Brickhouse. 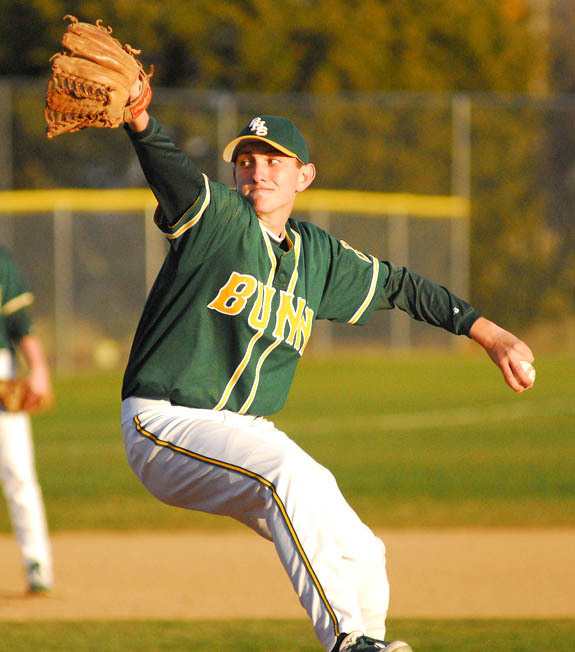 Sanders and Brickhouse, who have been standouts in Bunn going back to their Coach-Pitch days, has earned spots in the BHS lineup as ninth-graders. FANCY DRIBBLING SKILLS. Bunn’s Erica Levinson (left) controls the ball as Louisburg’s Phoenix Spivey defends during Wednesday’s matchup. 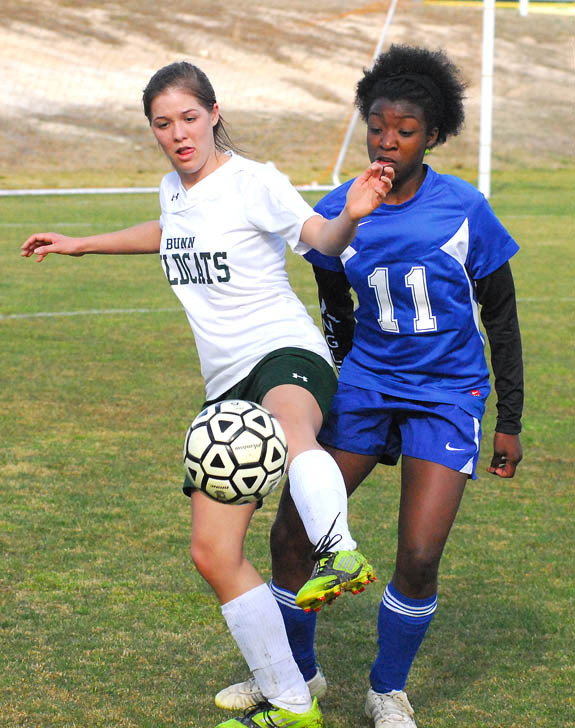 BUNN -- The lateness of the girls basketball season had a trickle-down effect to the spring sports at Bunn High School -- especially in girls soccer. Since he was so busy guiding the Ladycats to the Elite Eight of the Class 2-A State Hoops Playoffs, BHS coach Benj Daniels has decided not to oversee the girls soccer program this spring. JUST BEAT IT. Louisburg College’s Katrina Bartlett slides safely into second base during a steal attempt as part of Thursday afternoon’s home doubleheader sweep against the College of Albemarle Lady Dolphins. 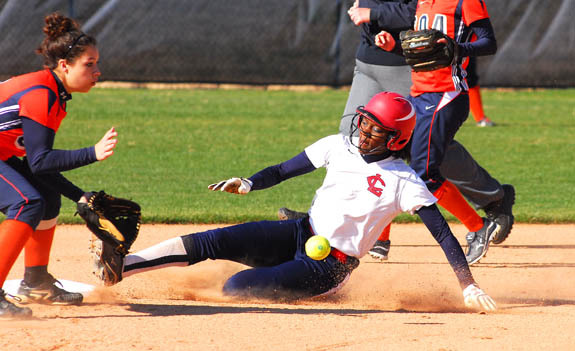 LOUISBURG -- After six consecutive losses -- and an 11-day break -- members of the Louisburg College softball squad were antsy about returning to the field Thursday for a home doubleheader against College of Albemarle. But the wait would prove to be a little more excruciating for the Lady Hurricanes as eight wouldn’t prove to be enough for the visitors from Elizabeth City. Even with a never-ending string of successes in recent years, there is still plenty for Louisburg College to prove on the national level for both the men’s and women’s basketball programs. Certainly, LC has established itself as a national powerhouse in hoops, but the Hurricanes and Lady Hurricanes are still in the hunt for a national championship. ON THE SLIDE FOR FHS. 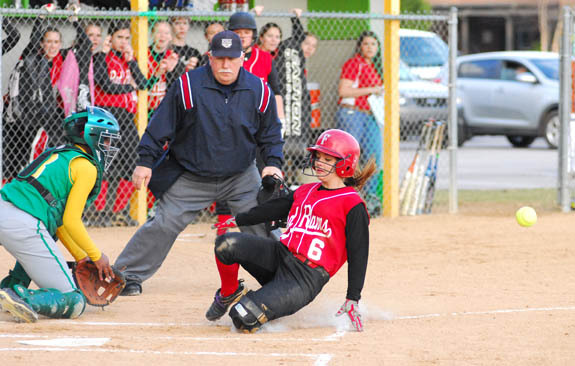 Franklinton’s Erica Goswick slides safely into home plate during Wednesday evening’s road fast-pitch softball setback against the Bunn Ladycats. 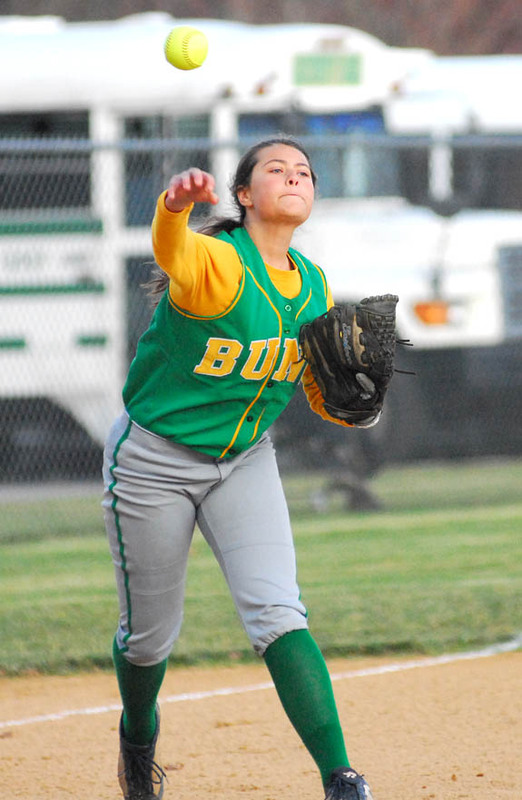 BUNN -- Bunn’s late run through the Class 2-A Girls Basketball State Playoffs meant that a handful of players wouldn’t be available for the start of the spring sports schedule -- including BHS softball catcher Jayla Cofield. Last season, Cofield developed into one of BHS’ fast-pitch team leaders. Franklinton at Louisburg 6:30 p.m.
Corinth Holders at Bunn 6 p.m.
ANDERS ON TARGET. 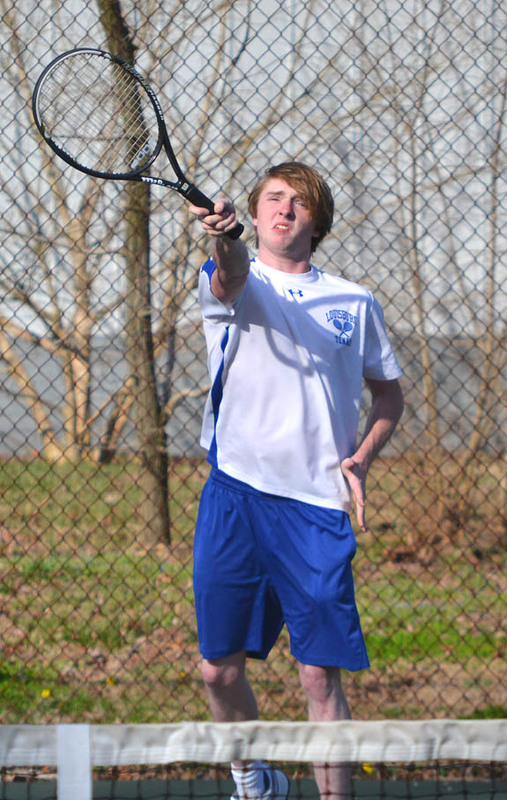 Louisburg High School’s Luke Anders returns a forehand at Roanoke Rapids. ROANOKE RAPIDS -- Louisburg High School traveled to Roanoke Rapids on Wednesday and was defeated by a team score of 8-1 in Northern Carolina Conference boys tennis action. LHS’ lone victory came at No. 1 Doubles as Alejandro Rivera and Quint Hester teamed up for an 8-6 decision over Roanoke Rapids’ Xac Fromal and Davis Felts. KINSTON -- The Louisburg College baseball team played a midweek single game Wednesday at Lenoir CC, and the Hurricanes were defeated 6-5 by the Lancers. Tyler Holt got the start but didn’t figure in the decision as he gave up three runs on five hits. Left-handed pitcher Daniel Batts took the mound in relief and gave up two runs and fanned four LCC hitters through three innings before giving way to Alex Ledford, who picked up the defeat. 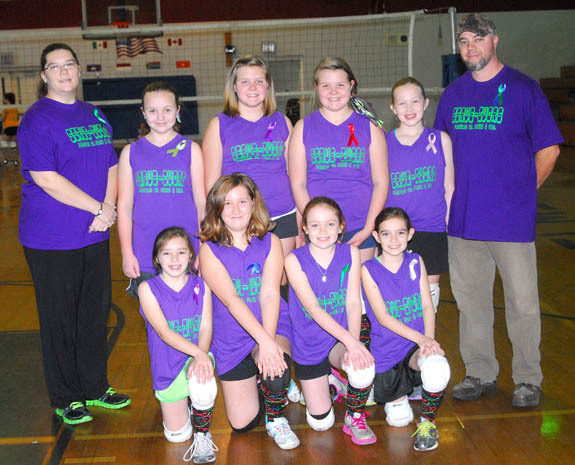 LOUISBURG -- ‘The Serve-Ivors’ took their name to heart this season in the Franklin County Parks and Recreation Department’s Ages 8-11 Volleyball League. During each match, members of the squad wore ribbons to commemorate a friend or relative who suffers from a debilitating disease. LOUISBURG -- The Louisburg College Department of Athletics has released the names of four former student-athletes and two coaches who will make up the Athletic Hall of Fame Class of 2013. Wayne Benton and current Hurricanes Athletic Director Mike Holloman ’83, both of Louisburg, will be honored for their time roaming the sidelines with the men’s and women’s basketball programs, respectively. 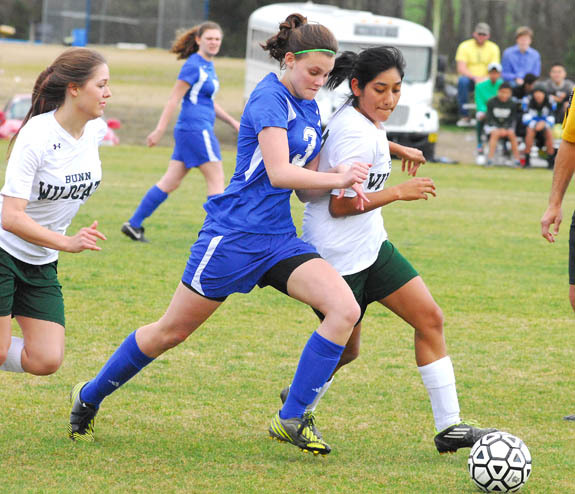 Talented players Kelsey Harris (Louisburg, second from left) and Lucy Perez (Bunn, right) jostled for position for much of the match during Wednesday afternoon’s Northern Carolina Conference girls soccer contest on the BHS campus. Bunn freshman third baseman Charlotte Murphy throws out a Franklinton batter during Wednesday’s softball game. Bunn’s Jackson Lewis comes up with a base hit for the Wildcats during Wednesdsay’s home conference victory against the Franklinton Red Rams. Major League Baseball pitching great Joe Nuxhall used to refer to himself as ‘the old left-hander.’ Well, here is ‘the young left-hander' -- Bunn High School freshman hurler Nicholas Sanders, who earned the mound victory Wednesday against the Franklinton Red Rams in Northern Carolina Conference diamond action. Some major changes are coming to Franklin County schools as a result of three retirement resignations approved during Monday night’s school board meeting. Deborah Ayscue, Edward Best principal; Rodney White, Edward Best assistant principal, and Dale Byrns, Creative Education principal, are all retiring at the end of the current school year. Vance-Granville Community College nominated a student from Louisburg as a candidate for a statewide leadership award. Frank D. Allison, a student in the College Transfer program, will be considered for the North Carolina Community College System’s Governor Robert W. Scott Student Leadership Award. The case against a used tire salesman gained traction when narcotics officers seized cocaine and marijuana while executing a search warrant. Deputies charged Deshaun Williams, 39, with possession with intent to manufacture, sell and deliver a controlled substance, felony and misdemeanor maintaining a dwelling for the sale of a controlled substance, felony possession of cocaine, simple possession of marijuana, and possession of drug paraphernalia. YOUNGSVILLE — Franklin County commissioners are expected to adopt a resolution on Monday night that would facilitate the transfer of the town’s water and sewer system the next day. Youngsville’s governing board already approved similar documentation this past Thursday. “It’ll be effective on Tuesday,” said Youngsville Mayor Sam Hardwick. “It’ll be their system. LOUISBURG — After some stops and starts, a Franklin County recreational advisory board will pitch commissioners a new site for a park. In January 2010, Louisburg resident Edgar Owens left the county $976,000 to build a new park, complete with a fishing pond if funds allowed.